Classes from Frog Hollow Designs by Linda Hahn. Quilt patterns and kits. Click here to login and view supply lists - Linda will provide a password with signed contract. Linda's classes are fun and empowering. She takes what looks complicated and breaks it down into easy to understand and "do-able" steps. Be ready to learn a lot and laugh a bunch!! A fully signed contract (Linda's) will secure the dates. Supply lists will be sent approximately (6) months prior to Linda's visit. Linda is willing to visit multiple guilds on the same trip. Please check with other guilds in your area - or along the route - to share expenses. This is a WORKSHOP exclusive! The pattern is only provided to workshop students! This design is only available in WORKSHOPS with Linda. 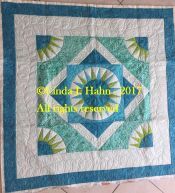 Learn Linda's ONE PIN technique to create perfect New York Beauty blocks on your first attempt....no puckers....no ripping...no cussing! You will then incorporate those blocks into a larger block that has NO set in seams. Once you learn this technique, you can make up to six blocks an hour!! Seriously! 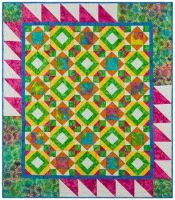 This quilt gives the illusion that the circular part of the block is appliqued on top of a half square triangle. However, it is all pieced! You will learn Linda's ONE PIN technique for creating perfect New York Beauty blocks on the first attempt. 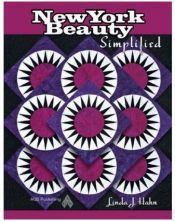 The kit contains a hand out with two alternate settings for this quilt top. Learn Linda's ONE PIN technique for creating perfect New York Beauty blocks while making a small wall hanging. Learn Linda's unique ONE PIN method for creating perfect New York Beauty blocks on the first attempt. You will be able to design your own frog pond using the fused applique flowers, cat tails and frog heads. Let's get funky!! Learn Linda's ONE PIN method of creating perfect New York Beauty blocks. 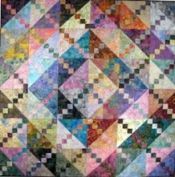 Stitch the blocks together individually into quiltlets and then assemble the quiltlets using connecting rectangles. Here's a chance to give simple foundation piecing a try. It's VERY different from the "traditional" foundation paper class. 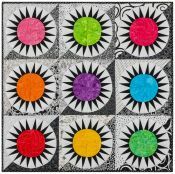 A truly fun quilt to make that lends itself to many different fabric collections. Students will discover just how fast this can be pieced as Linda explains the breakdown of the blocks and then shares her super quick piecing techniques. Most of my workshops can be offered as full day or half day presentations in that they are technique oriented. You are welcome to request two half day workshops in place of a full day. Workshop from the AQS Best Seller book of the same name. Learn how to make spectacular NY Beauty blocks using just ONE PIN! Students will learn Linda’s technique and be able to choose the layout they wish to use. We’ll cover a really easy way to quickly paper piece the arcs (“crown”), as well as quilting options for the New York Beauty. This workshop is JUST the technique. No specific project. Students will be able to choose their own layout. 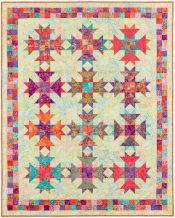 Use purchased yardage, pre-cuts or your Stash to piece this gorgous quilt! A popular StashBasher workshop. 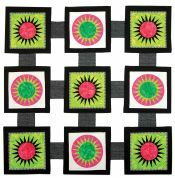 This piece uses 72 pair (matching) of 6” squares. Super cute project that goes together quickly. This project can use scraps or pre-cuts plus a background. Partially paper pieced - no experienced required. Did you know that Linda is a licensed Zumba instructor?? After a long day of sitting at your machines, why not try out a basic, low impact Zumba class? Class can be 30 - 60 minutes.